"The president has signed the bill," Tsegolko tweeted. On Thursday, the Ukrainian Parliament adopted a bill aiming to deprive the canonical UOC-MP of its name. To take effect, the bill needed to be authorized by the president. Under the legislation, the UOC is obliged to change its name within four months and make the relevant amendments to its charter. The UOC earlier appealed to Poroshenko to veto the bill. Despite the pledge not to interfere in church’s affairs, the Ukrainian authorities do it regularly. 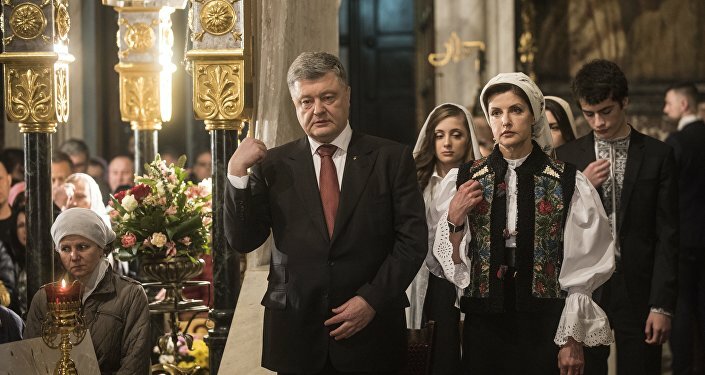 Poroshenko, for instance, secured a pledge from Constantinople to a grant a tomos on autocephaly to the newly-created church, which was condemned by the Russian Orthodox Church as schismatic. In October, the Ukrainian parliament approved a bill on handing St. Andrew's Church, located in Kiev, over to the Ecumenical Patriarchate of Constantinople for permanent use. Poroshenko's adviser Rostyslav Pavlenko went to Istanbul to observe the Synod meeting and discuss with the Constantinople patriarch the issue of autocephaly. The UOC-MP has also repeatedly reported of cases of attacks on its priests by radicals and seizure of its churches by representatives of non-canonical religious structures.